Our modern business environment has created multi-faceted companies with offices spread over wide areas; they can be within the United States, or around the world. People from these different locations must communicate on a regular basis, and also often need to meet in person to further company projects for both short and long-term goals. Today’s technology allows the creation of multi-function facilities to facilitate that communication. Sumitomo Corporation of America (SCOA), the largest wholly owned subsidiary of the 300 year-old family run, Japan based Sumitomo Corporation, is one of the world’s leading traders and distributors of goods and services. With hundreds of subsidiaries around the world–its largest is headquartered in New York City–this is one company that needs to take full advantage of available opportunities. When SCOA began the process of moving into a new headquarters facility at 600 Third Avenue, it called upon the Walters-Storyk Design Group to create a versatile state of the art multi-media executive boardroom that would carry them well into the 21st century; a space that would allow them to hold in-person managers’ meetings, as well as communicate with other members of the company from offices throughout the US, and more than 100 countries worldwide. SCOA’s requirements for this space were extensive and ambitious. They required a space that was versatile enough to comfortably accommodate a full range of meeting sizes and types, and intelligently designed to seamlessly support the latest in A/V and communications technology. The room may be used one morning for a small in-person meeting with a handful of participants, and that afternoon for a 60-person audio/video teleconference. Other times, through the employment of a movable partition system, it will be required to handle two, small to moderate sized meetings, simultaneously. The room will be technologically outfitted to support almost any audio and video teleconferencing, presentation, or recording/playback scenario. 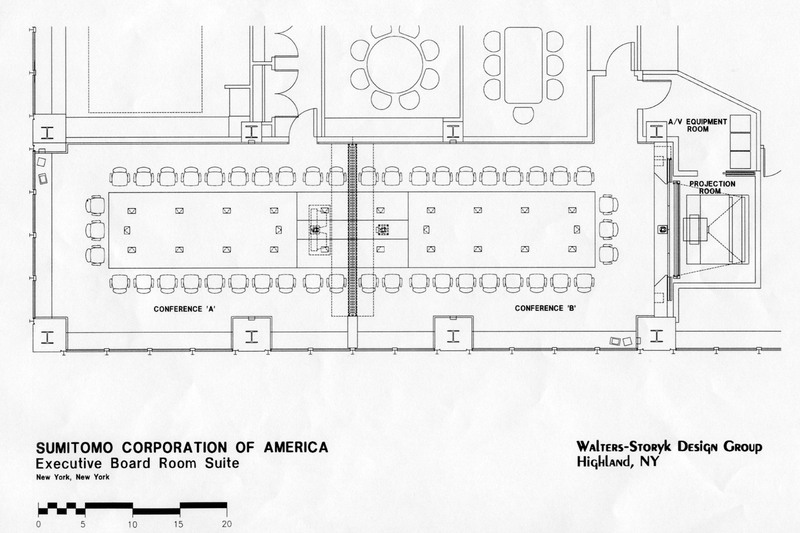 Because of the narrow column spacing in the building, the size requirements of the space based on the program, and the desire to be on the edge of the building for the great views of lower Manhattan, the resulting shape of the Executive Boardroom was long, narrow and rectangular. Given its unusual proportions, this space presented significant acoustic and ergonomic challenges. The ideal shape of a multi-media conferencing environment, especially those with video conferencing, is one that provides clear sight lines from each seated position to the projection screen(s) and from video conferencing cameras to each seated position, in other words, semi-circular. 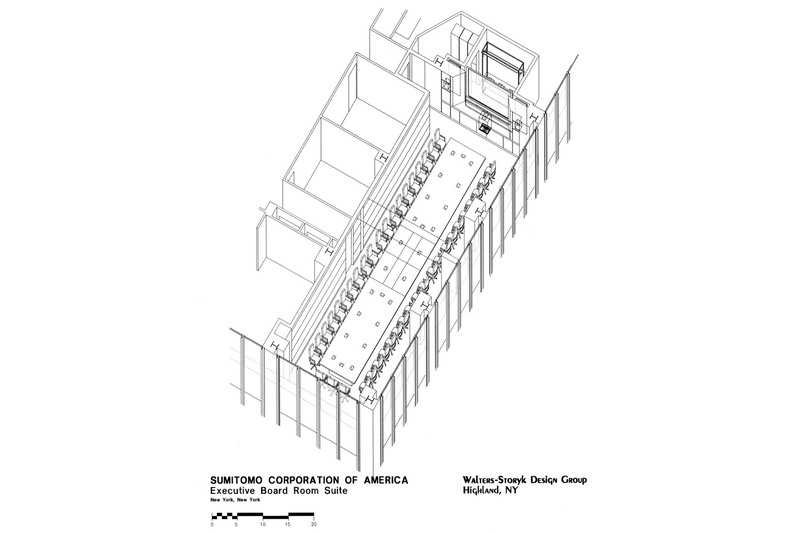 Any sort of semi-circular or v-shaped layout for the Sumitomo Boardroom space was precluded for the reasons mentioned above, so the challenges were overcome through the design of special wall and ceiling acoustic treatments, intelligent placement of video screens, microphones and cameras, and the implementation of a mix minus speech reinforcement system. 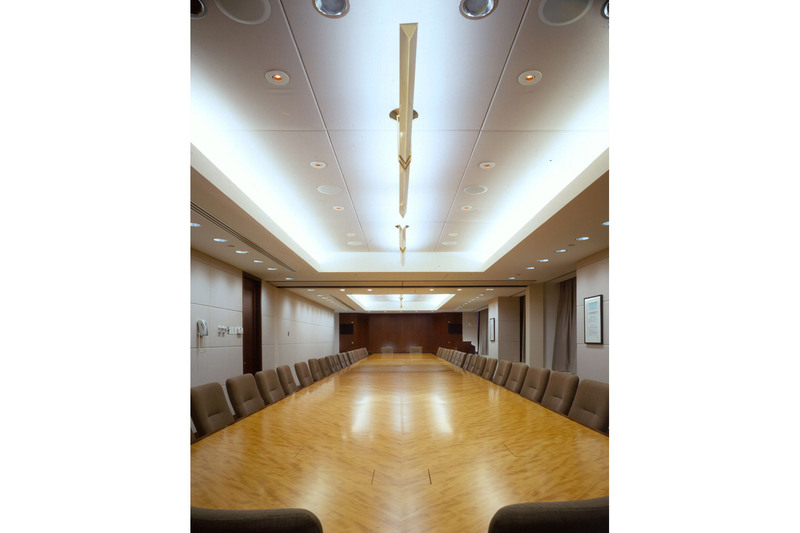 The Executive Boardroom Suite consists of the Boardroom, a dedicated A/V equipment room accessed from the front entry alcove in the Boardroom, and a rear projection room accessed directly from the A/V equipment room. The Boardroom itself is 66 feet long and 21 _ feet wide and is dividable via a ‘Skyfold’ partition, which is a movable partition that descends from the ceiling into two similar sized smaller conference rooms. Each of these smaller conference spaces can be used simultaneously; each room has its own entrance and dedicated A/V equipment. The front room (Conference ‘A’) utilizes the large main rear projection screen and rear room (Conference ‘B’) utilizes a pair of 29-inch tube VGA display monitors, which are lowered from the ceiling via a two-position lift to the height of the conference table (speakers and videoconferencing camera are also integrated into the lift design). This lift also has an intermediate position just below the ceiling, for use in the large room configuration to facilitate viewing from the back of the room. The main projection screen, which is rear projection and located at the front of Conference ‘A’, at 115″ x 65″, is adequately sized to serve the entire length of the room in the one room configuration. One of the highlights of the room’s design is this main screen and camera system. The screen can be used in three different configurations, with motorized wood doors that crop the screen to the desired size. The screen can be used as one giant 16 x 9 image for widescreen formats such as video and films, two (58″ x 44″) side-by-side 4 x 3 images for showing two independent images simultaneously, such as the far side and near side or the far side and a document while videoconferencing, or one large 4 x 3 (86″ x 65″) image for standard powerpoint presentations, etc. To establish natural interaction [for videoconferences], the camera was positioned at eye level in the screen. 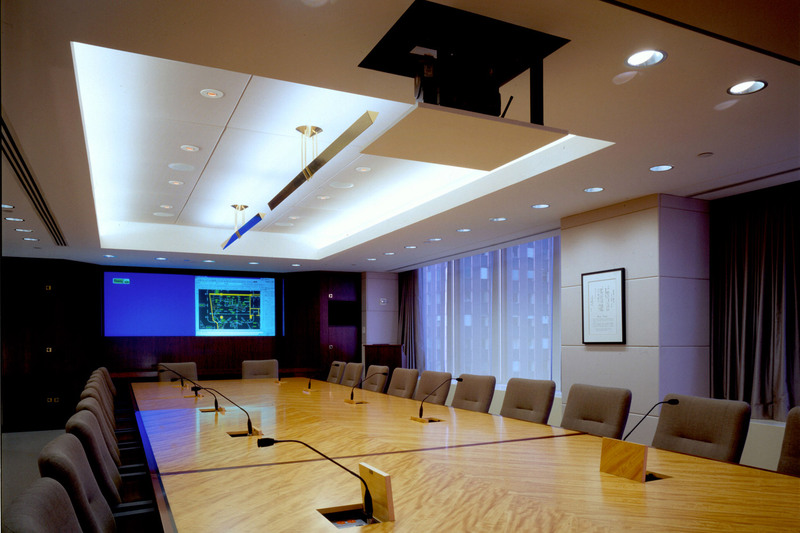 One of the main challenges encountered in most video conferencing rooms is camera placement. There is always a fight between the screen size and camera placement. For viewing purposes, the client wanted the largest screen possible so that it occupied most of the front wall, leaving no room for good camera placement. In cases like this, most people would place the camera to the side or above the screen, but then the camera views the conference participants from an angle other than looking directly at the screen, resulting in camera shots of the tops or sides of people heads, not natural two-way interaction. Ideally, the camera should be placed in the screen where participants are looking, simulating as close as possible a two-way conversation. For this, WSDG developed an automated system whereby the camera comes up out of the lower cabinet under the screen via a motorized mechanism to eye level position just in front of the screen. Because the camera is black and quite small it is hardly noticeable and in most cases blends into the image typically, the bottom third of the image during video conferencing is a conference table. The speech reinforcement solution employed the Peavey Media Matrix with a mix minus system. This system acts to amplify the speakers voice across the length of the space where needed, to provide an even, natural sound, that does not sound amplified. The system works by attenuating the speakers closest to the source microphone a few Db and progressively increasing the amplification in the speakers the further they are away from the source, providing natural, even sound throughout and eliminating feedback. The custom conference table is outfitted with (22) flip-top compartments that house power, LAN connections, microphones, and in some locations connections for video and audio via laptops to the screen and Crestron touch panels.